Charleen Smith had many beautiful hand made quilts to show us, but this one is her pride and joy. It is a very artistically and intricately done crazy quilt featuring Charleen's lovely handwork and found objects, with no two settings of stitches the same. Charleen explains some of the finer points and special momentos, as Jody Bugg looks on. 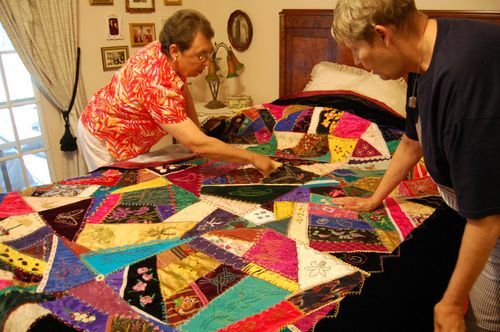 There is now a photo album devoted exclusively to details of Charleen's crazy quilt. Check it out. To comment on this album, click on the word "comment" at the bottom of any Post or Page.